In modern agriculture, pigs are fed a diet of mainly grains, but heritage pigs love grass, and our American Guinea Hogs are no exception. In winter, we used to feed them hay, but they wasted it terribly! If you think goats are wasteful, try pigs! You can’t use a hay feeder with pigs. You have to put it on the ground because their mouths are below their snouts, and they leave behind a lot of hay to compost. A couple of years ago, we started feeding them alfalfa pellets. I admit it was not because I was so brilliant. It was totally out of necessity because it was late winter, and we were running out of hay. It became obvious our hay supply would not last until spring grasses were tall enough for grazing, so I took some of the goat’s alfalfa pellets and mixed them with the pigs’ brew grain and pig feed. The pigs left the pellets behind and ate around them as they scarfed up the grains. Knowing that they loved alfalfa, I figured it was the hard pellets that had turned them off, so we started soaking it. We fill a bucket half to two-thirds full with alfalfa pellets and then cover it with water by about an inch and let it soak for at least half an hour. The pellets fall apart and swell up a little, and we mix them into whatever else we are feeding the pigs that day, and they gobble up all of it. We no longer feed actual hay to the pigs during the winter, so even though the pellets cost more per pound, we are saving money because there is zero waste. Since this is alfalfa, you can feed them as much as they want because this is the salad bar for them during the winter. However, if you have Guinea Hogs, do keep an eye on their weight, and if they start to get fat, you need to feed less. They are extremely easy keepers! Also, if you are feeding this in winter, don’t put out more than they’ll eat before it freezes (because there is water in it now). I doubt pigs would be fond of frozen alfalfa pops. 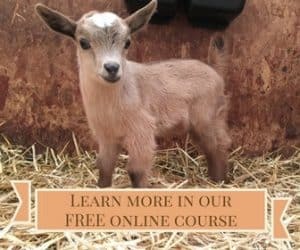 If you have goats, be sure to check out the post I did last fall about feeding alfalfa pellets to goats, which we’ve been doing for more than ten years. Even though Standlee Forage doesn’t advertise their pellets for pigs, they love the fact that some of us are feeding them to our little porkers. I love their products so much that I became a brand ambassador for them in 2017 after buying and feeding their products to my goats for about ten years. When this post was originally published, they gave away a bag of alfalfa pellets to one of my readers. What a smart use for alfalfa pellets! I’ve been feeding alfalfa pellets for other critters for ages, never considered pigs. We are going to be getting our first guinea hogs this summer, and I definitely want to try this! I have never considered pigs wasteful of hay, but then, I’ve never thrown it on the ground for them to eat. I feed good, leafy alfalfa hay, at about a quarter the price of pellets, or soft, leafy orchard grass hay. It’s very easy. My pigs live in polydome calf hutches, which are circular and about 8 feet across. They are small enough that the pigs go outside to poo. I cut the thresholds down to about six inches high across half of the doorway so the pigs can get in and out easily. To feed hay to the pigs, I throw a flake or two of hay into their hutch. The pigs fluff it up, eat it, and use it to sleep in and keep warm. When the supply gets low, I throw in another flake or two. Far from wasting hay, my pigs use the hay I feed them for at least two purposes – as bedding to keep warm, and as feed. To me, that’s a great value. 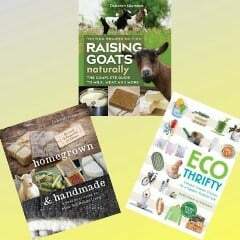 You have smart and thrifty pigs! Once mine start using it as bedding, they don’t eat it anymore. Since straw is cheaper, I’d prefer they not use hay as bedding. What a great idea! 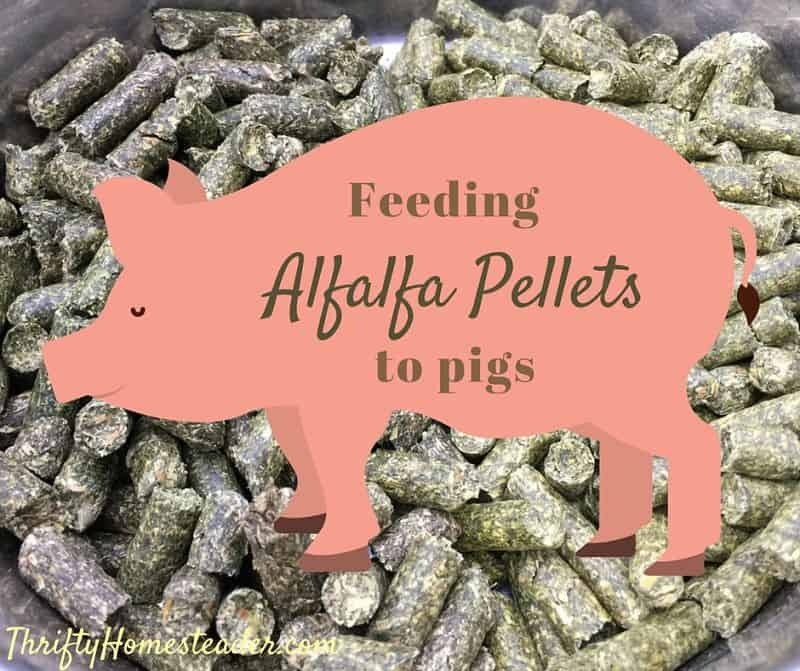 I have been using alfalfa pellets for my goats for several years, but had never thought about using them for pigs. I want to try feeding pigs alfalfa pellets. We are thinking about getting some of these little guys next year. It’s nice to hear that the alfalfa pellets will also be offered organic. Alfalfa is one of the most popular materials to make pellets as animal feed. It is economical than grains and hays. I just had this idea about feeding alfalfa pellets to my guinea hogs, looked it up online and here I am. My next biggest question is where do I sell my 20 baby guinea hogs? Any suggestions? There are several AGH groups on Facebook where people list pigs for sale. We sell a lot as whole hogs for pork and deliver them to the locker for our customers, so you can start asking your friends and relatives to see if they want to buy pork from you. We sell them for $4.50 per pound, hanging weight.